Close to the Olympic Nation Park and all of its benefit’s is nestled this great cabin! Its located on the point of Lake Sutherland which gives all day sun. Our cabin has 2 bedrooms which sleeps 6 (Master has a king bed and Bedroom 2 has 2 queen beds and living area also) on the upper floor, along with a half bath. The main level has a full bath, living room, dining room, kitchen and laundry room. The outside porch and patio face the lake, so you miss nothing. Plenty of seating for everyone. 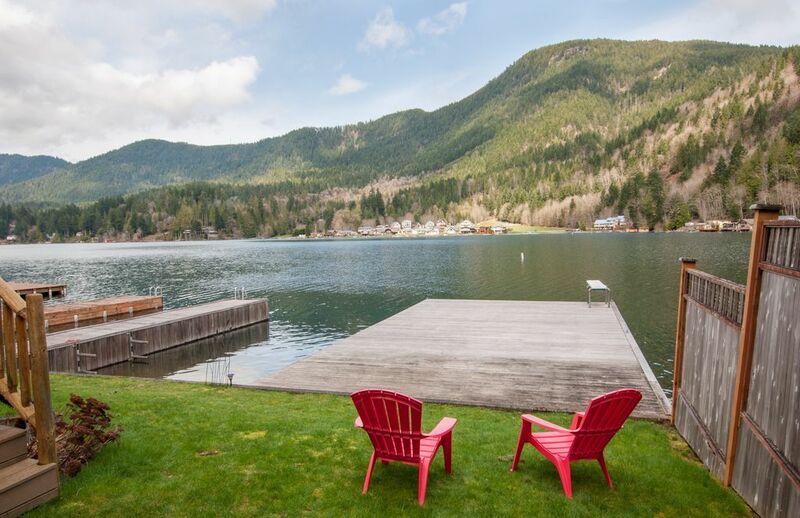 There are 2 private docks on beach-level property! While we are family friendly, please know not all is child proof. **Check in time is 3PM and check out is 11AM. Lovely home and we enjoyed our stay here! The facitlities and the location right by the lake is a dream. Thank you so much for sharing your lovely home with us! We loved this house! Our family of four stayed here for 3 days, and we didn't want to leave. The house is super cute and well appointed, the setting is beautiful, and the communication and hospitality from the owners was great. The house is well appointed, with a well stocked kitchen (including spices, oils, all the little things you need), super cute decorations, comfortable beds, and a great outdoor space. We really enjoyed the lake, including using the kayak during the morning before the wind kicked up. The Weber propane BBQ was appreciated as well. We've rented a lot of VRBO places, and this is among the best. Fully recommend without hesitation, and we can't wait to return. Thanks Leonard & Kelsey ! Courteous owners, neat and clean house, fantastic location on the lake. Great experience! Phenomenal house on the lake chocked full of amenities! This place is really great; clearly run by owners who care not just about the income but also the experience of their guests. Kelsey and Leonard have done an excellent job of setting up extremely comfortable furniture in a clean home right on Lake Sutherland. Communication was excellent and we were blown away by the number of amenities and supplies at the home. Great for a family outing or a romantic getaway. I wouldn't hesitate to recommend and hope to return some day. My family (husband, 9 year old daughter and I) stayed here for 3 days in July. The house is in a great location to visit the north and eastern sides of ONP. The house is very well appointed, with plenty of kitchen items, which we used often. We also loved the grill and having a washer / dryer. The house was clean and large and the bathroom is spacious too. We tried to take the pedal boat and kayaks out but it was too cold in the mornings and too windy in the afternoons. We didn't swim because it is way too cold for our Texas blood! We curled up in the cozy blankets in the evenings. I would recommend this for a peaceful stay!